When: Friday November 22nd to Sunday November 24th, during regular business hours. Kat & Rob McDonald have been making and selling wine for 20 years in 3 countries. Rob grew up in Australia's famed Adelaide Hills wine region amongst many of the vintners he would one day represent as importer into the USA. In fact, the business Kat and Rob founded (Old Bridge Cellars) led the charge of high quality, family owned, Australian wineries into the USA in the early 1990's. During this time, Kat and Rob established their own dry grown, naturally farmed vineyard in Heathcote, Victoria. They also purchased and farmed a prized Napa Valley Cabernet Vineyard and collaborated with many other great winemakers in Australia and New Zealand to make a diverse and highly regarded set of wines. Matt Stone's family founded Napa valley icon, Sterling Vineyards in 1964. As a young man, Matt earned his first paycheck from the winery and helped his father with many aspects of vineyard and winery life. Keeping his nose close to the wine industry, Matt moved to France and took up residency with the Edmund Rothschild family (Lafite side) where he was actually present for the inaugural harvest of their Chateau Clarke in Medoc. After his stint with the Rothschild's, he honed his sales skills as a sugar trader in Paris and New York. In 2000 he returned to Napa Valley with his wife and 3 children, a move that virtually ensured his re-entry into the wine business. Kat, Rob and Matt, met at the school their children attended in Napa and a business partnership was formed in 2005. Much like the diversity of our founding families, the Art+Farm winemaking philosophy is grounded in two equally important but radically different approaches. The girls in the vineyard is a celebration of time and place, recognizing and embracing the effects of a particular set of climatic conditions in a given year and how those conditions impart their own distinctive character. Therefore the girls celebrate a single vintage, a single varietal and a single vineyard. 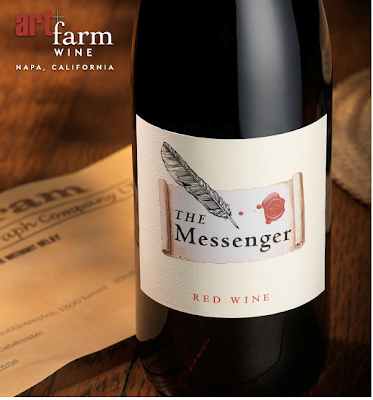 The Messenger Wines are an exploration of flavor born of creativity and innovation. As such, they are mulit-vintage, multi-varietal and multi-vineyard. In the same way a message is crafted from a thousand stories, we craft wine from a thousand possible blends. The Messenger encourages you to enjoy a wine for what it is, rather than what you think it should be.